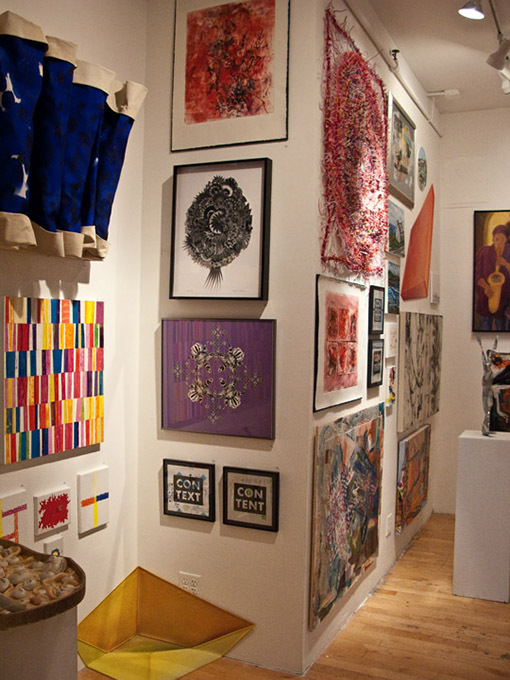 Collage enthusiasts – if you want to see important contemporary and historic collage, and also want to see assemblage and mixed media installation, go to the Pavel Zoubok Gallery in Chelsea, 531 West 26 Street, NYC. . Every month the gallery showcases artists who explore and extend the boundaries of these media. See more information about the gallery here. 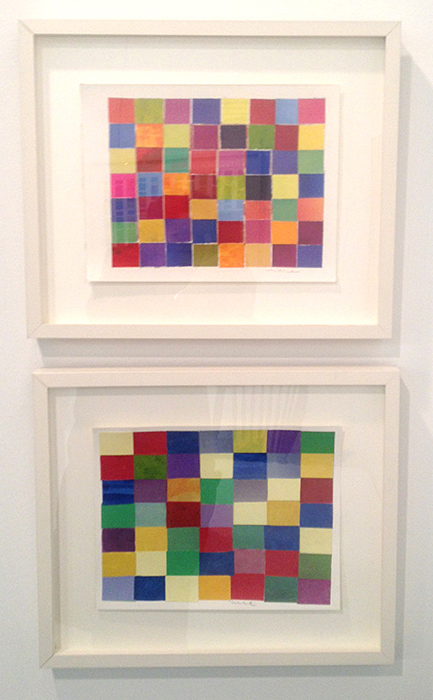 I went to the gallery to see collages by Ivan Chermayeff. I’ve been a fan of this artist’s work for years. 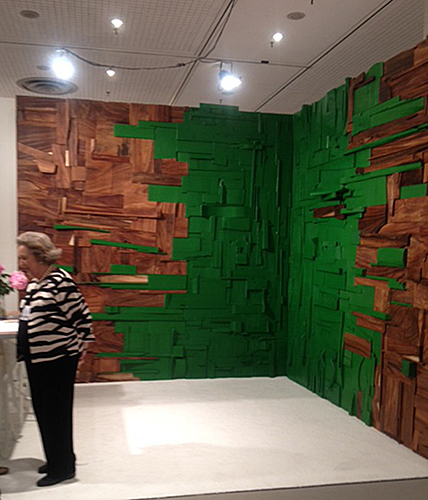 The exhibition (March 20-April 19, 2014) also included his wood assemblage. 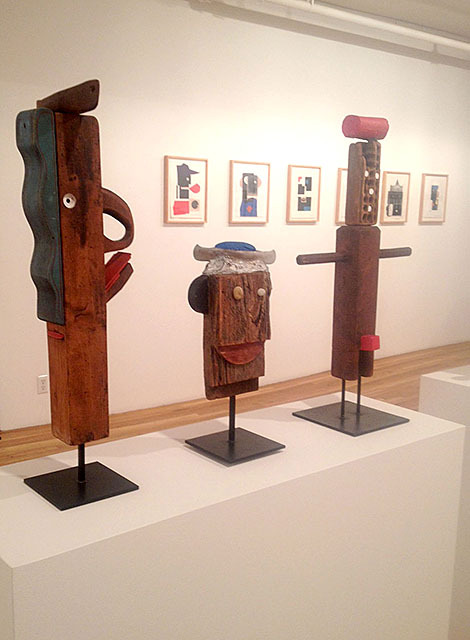 My image above shows the gallery installation of 3 Chermayeff wood sculptures on white pedestals. It also shows framed collage portraits installed on the rear wall. 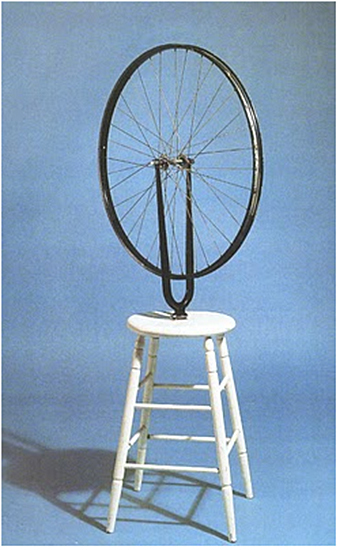 This is collage sculpture. Notice the work is assembled with pieces of found, carved and painted wood. Chermayeff juxtaposes old materials and objects like toys, tools, river stones, sandpaper, and brushes to create heads and torsos. 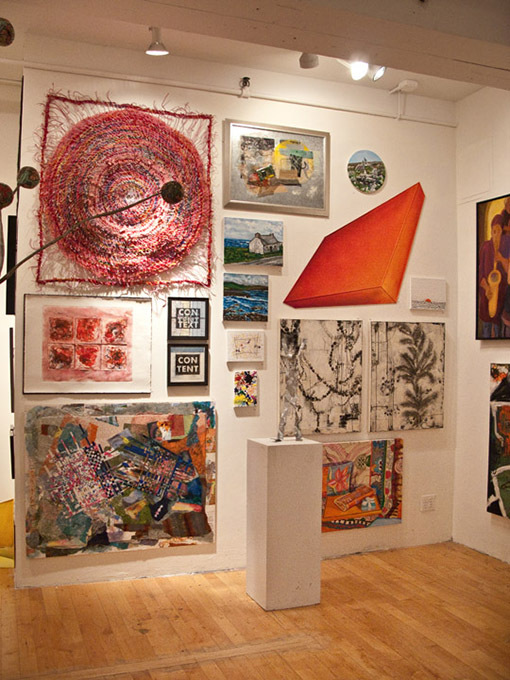 Each sculpture (like each collage) has a unique personality. Notice the 2 figures and face are embellished with painted wood in red, white and blue for eyes, noses, lips, ears, hats and anatomical parts. Sorry you can’t walk around the sculpture to see them in person. I love the tall sculpture on the left in the photo. He has a protruding wood nose that reminds me of a handle on a big coffee mug. His lips are pressed together, and almost touching his nose. You can read whatever you like into his expression. That’s what makes the sculpture so interesting. 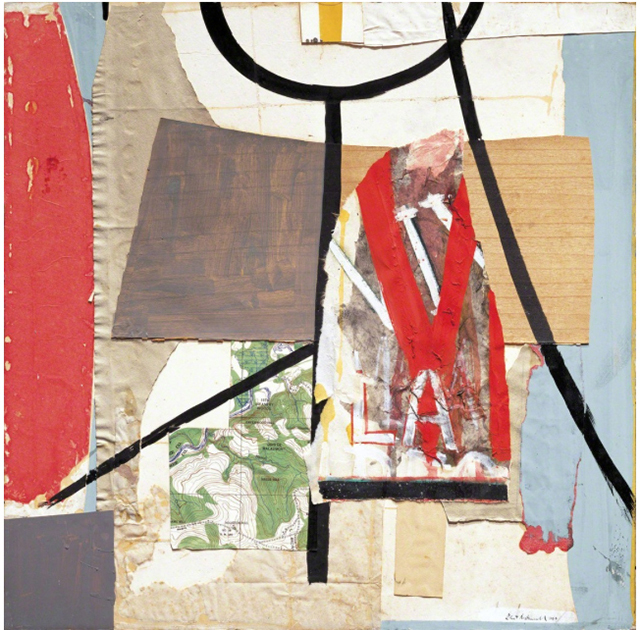 DowntownMagazineNYC reviewed the exhibition that showcased works by Ivan Chermayeff (b 1931, London, UK) and photocollage by Witold Gordon (b. Warsaw, Poland, 1885-1968). In the review, Xavi Ocana wrote (March 20, 2014): Chermayeff has the ability to take the ordinary and turn it into the extraordinary, a perfect equation of the playful plus the poetic. 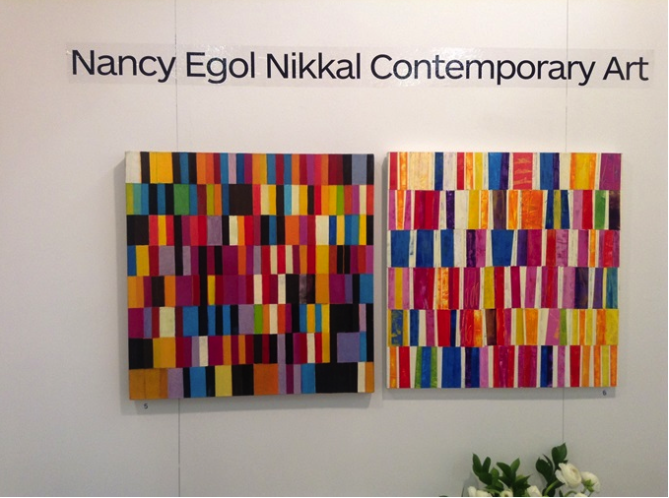 Read the exhibition review here. 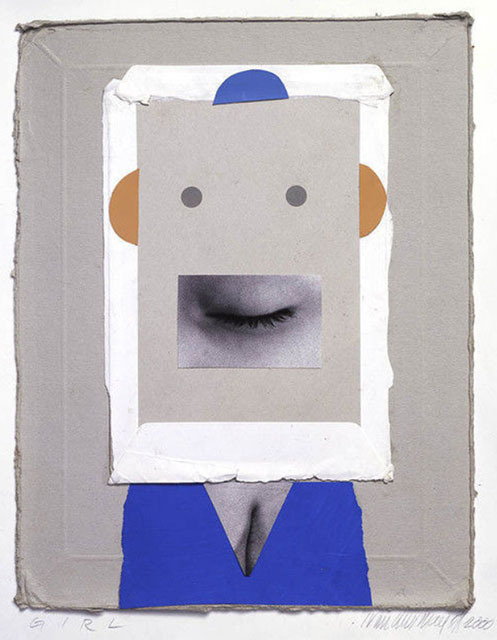 The image above is titled GIRL (2000), collage, 14 x 11 inches. It’s so simple and so very clever and witty. The shapes are dots, semi-circles and rectangles. The girl’s face is a grey paper rectangle and her eyes are round grey dots. 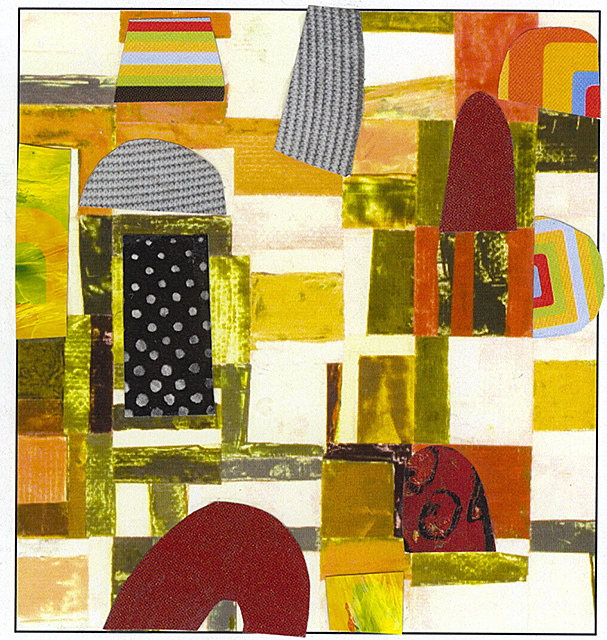 See the gold and blue cut papers – semi-circles that are ears and a hat. Notice her blue dress. It’s the same crayon blue paper as the “hat” and reveals a photo of deep cleavage showing through the V neckline in the dress. What a girl! The best part – her “mouth” is actually a photo of an eyelash. At first glance, you see a curved black line. It’s a happy-face smile. Then you notice it’s a fringe of eyelash in a closed eye. Very demure. How witty! My reaction: it’s a Mona Lisa smile. What is she hiding? In interviews, Chermayeff admits he has drawers full of old envelopes and postage stamps, and recycles gloves people drop and leave behind. 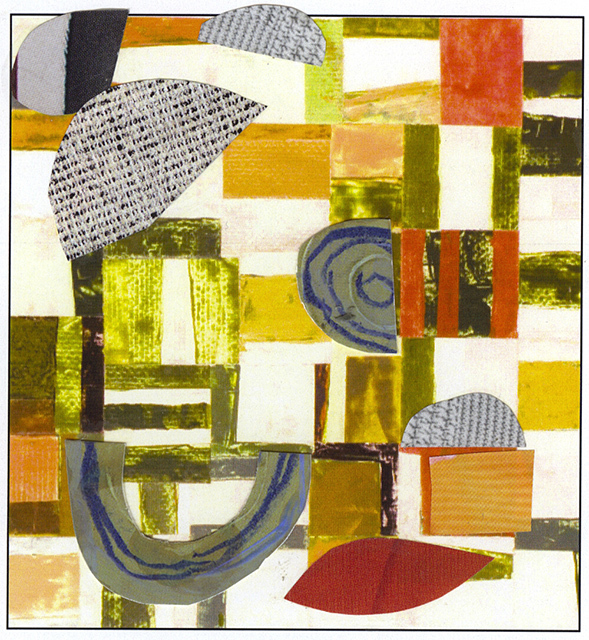 His approach to collage is spontaneous. He says. “What I’m playing with is making new visual connections. 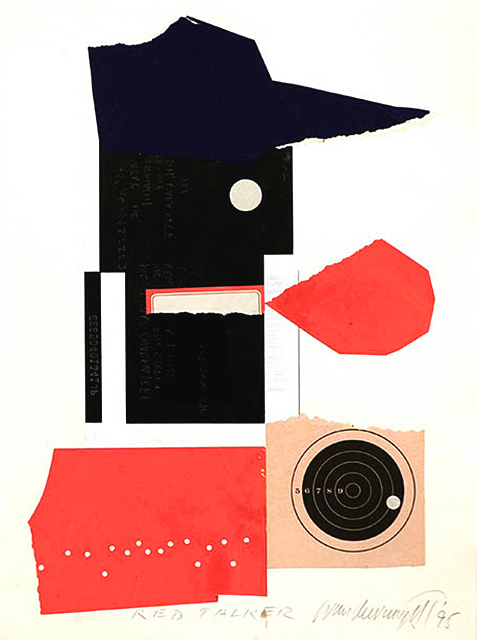 That’s what my collages are all about.” Chermayeff’s people are made from letterheads and labels, pebbles and Polaroid prints and stuff from the office recycling bin. The craftsmanship is meticulous, pristine and clean. They are not garbage. 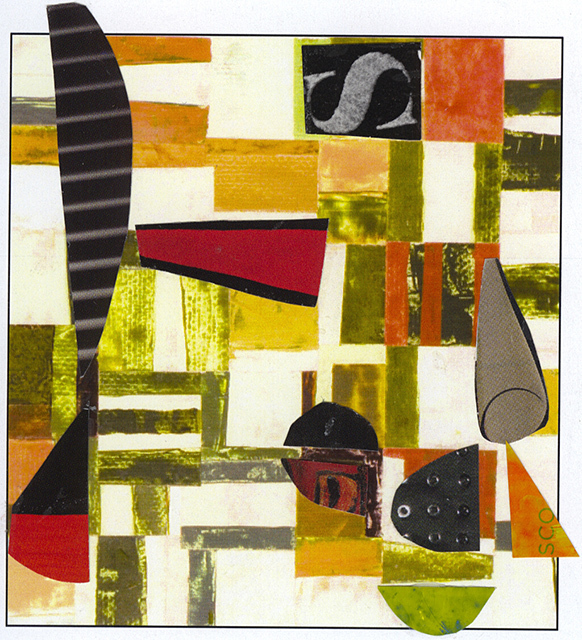 The image above is titled Red Talker, collage, 15×11 inches, 1995. Notice the colors: black, white, red and a peachy-tan. 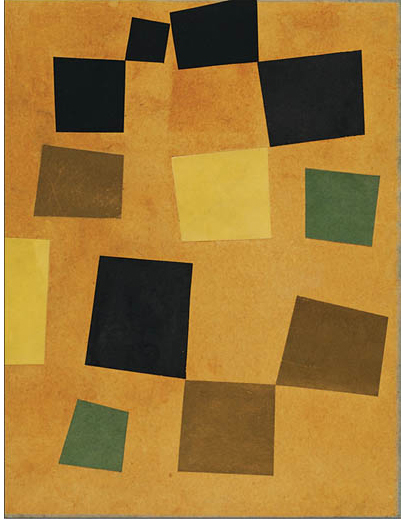 The portrait is all torn and cut papers in geometric shapes: squares, rectangles, circles and triangles. The portrait is facing right, and wears a hat. He has a large white dot for an eye. Notice some papers have tiny punched holes and show the white through. 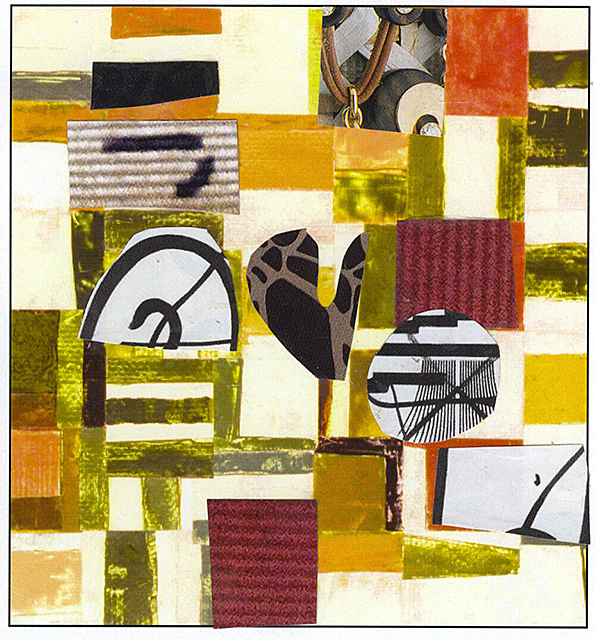 One collage paper is a printed bullseye with black concentric circles on a peachy tan background. There are multiple tiny holes punched in a horizontal line marching across the bullseye to meet a larger white dot in the outer black circle. See more punched holes in the red paper rectangle touching the bullseye paper. Notice the mouth is a torn red and white business form – probably a mailing label. Ivan Chermayeff is world famous as a designer and cofounder (1957) of the firm Chermayeff & Geismar, that produced the iconic logos we all know: NBC, PBS, CBS, Mobile Oil, Chase Manhattan Bank, National Geographic, the Museum of Modern Art and more. He graduated from Yale University and began his career designing book covers and album covers. 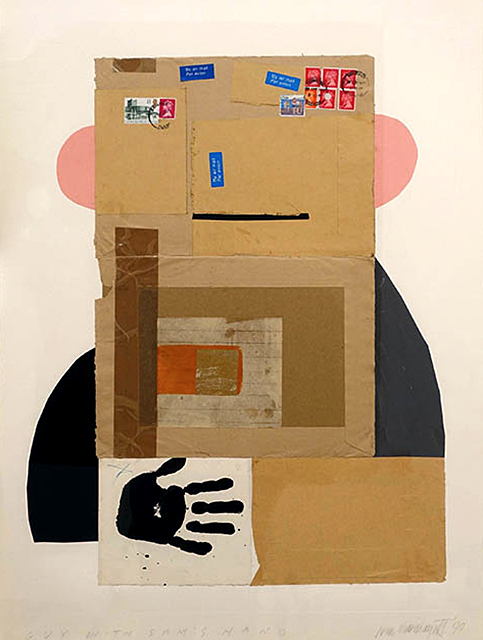 He is most famous for his logos, but also does collage and has exhibited in museums and galleries all over the world. PBS Brand logo designed in 1983 by Chermayeff & Geismar, Inc. According to artsy.net, Chermayeff (born 1932, London, UK) is an artist who rotates through multiple media. 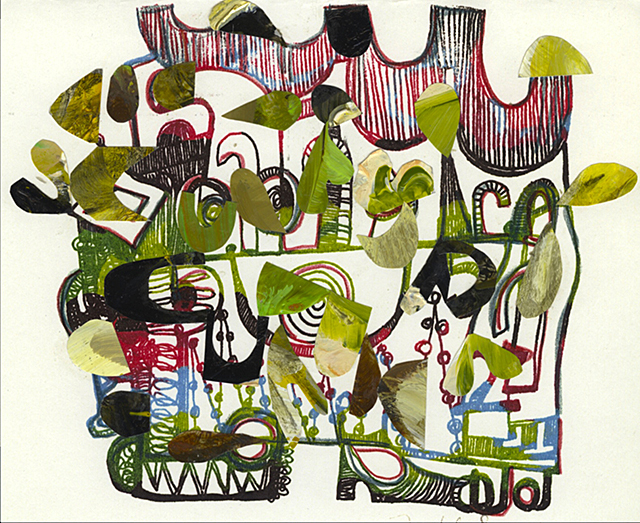 His strength as a designer and illustrator are equally present in his collage and printmaking media. They say, the works are ingenious and complex even though they look simple. Read more here. Ivan Chermayeff says “collages make it possible for everything to be something else.” That’s the essence of our contemporary lives. I talked to Pavel Zoubok at the gallery and learned so much about the artist and the art works. It was a great opportunity to speak with an expert. 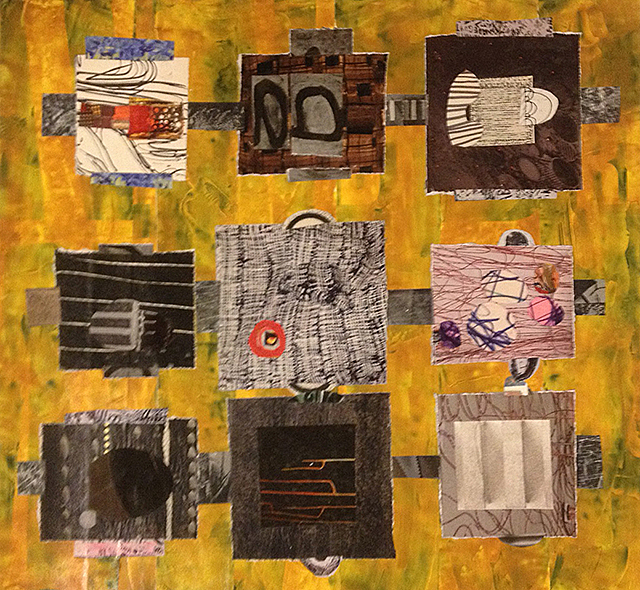 Zoubok is a passionate advocate for collage and has devoted his career to promoting this genre. Here’s a quote: Zoubok says we live in a cut and paste world. Isn’t that the essence of contemporary life? That is the essence of collage. 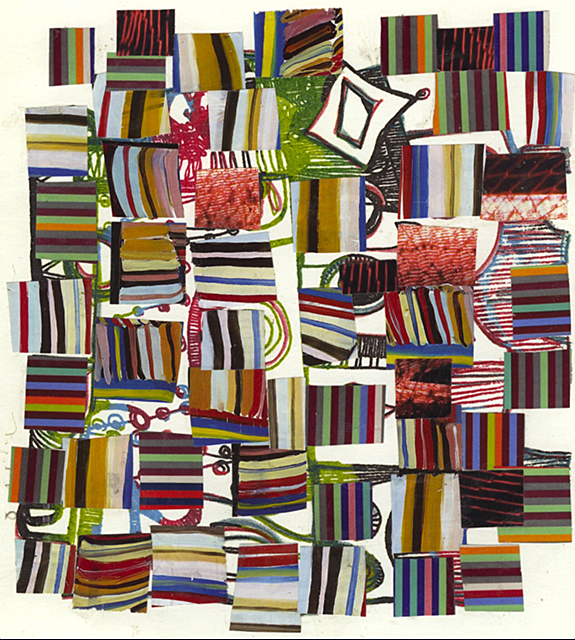 Zoubok also believes collage is manifest in the digital culture that is transforming our society. I absolutely agree. What Is All the Hullaballoo About? I am participating with the Hullaballoo Collective in a group exhibition in Chelsea in NYC this summer. 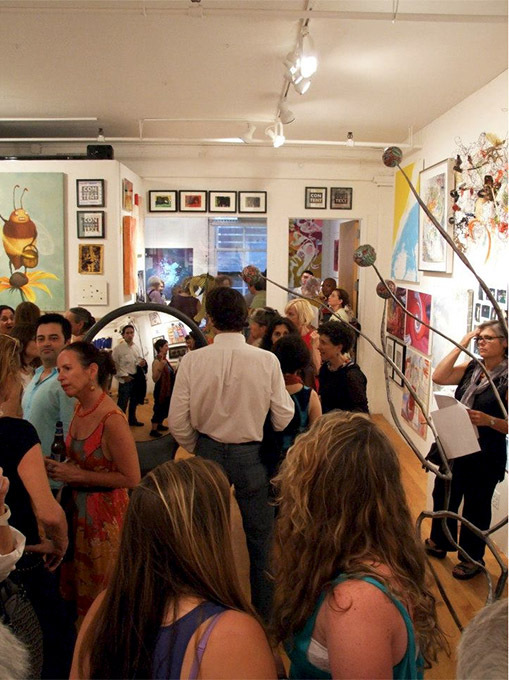 The view below is a peek into the 2nd Hullaballoo art show. 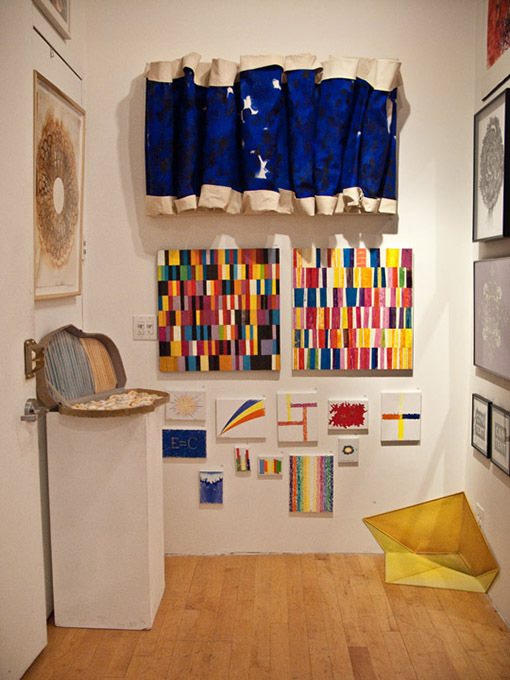 The exhibition is titled JOIE de VIVRE (August 2-19, 2012) and is installed at PSPS Paul Seftel Project Space , 548 W 28 St., NYC 10001, 3rd floor. The image below is a view of the reception. Thanks to Paul Seftel for including the Hullaballoo Collective in his gallery exhibition calendar. Thanks to Bernard Klevickas for being the point man in pulling this show together. Thanks to the many others in the Collective who were important to the success of the show. Thanks to Marianne Barcellona for taking the images in this post (except for the reception, taken by Phil and Colleen . Thanks to Bernard – again – for asking me to be the lead person for the installation. I had a great team of volunteers to help. Everyone thinks the show is a wonderful success. Following are images that show the installation. When you install a large group exhibition, you have to look at all the works that will be included before any work is placed or hung. This exhibition included many large sculptures that would dominate the central floor space. 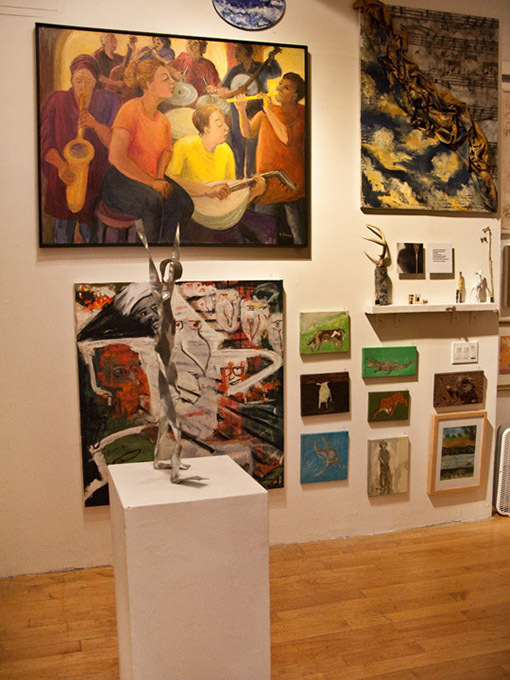 The works hung on the walls had to be visible beyond the sculptures, and every work in the show had to be integrated into the whole ensemble. 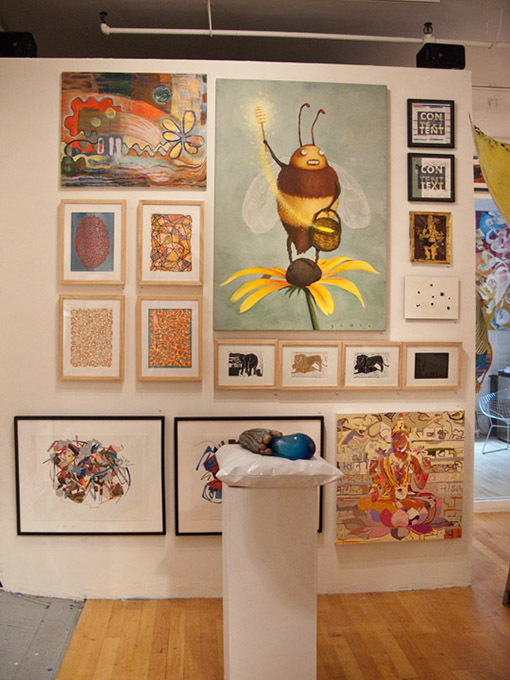 I saw the yellow bee and thought “he” was very inviting and needed to be seen by everyone as soon as they stepped into the gallery. The painting was installed first and the large free-standing sculpture in painted metal was placed in its space in relation to the art hung on the first wall. The mirror sculpture arrived later. The image below is a close up view of the works hung with the first painting. We worked hard to find the right works to compliment the bee. The next image below is a view around the corner. 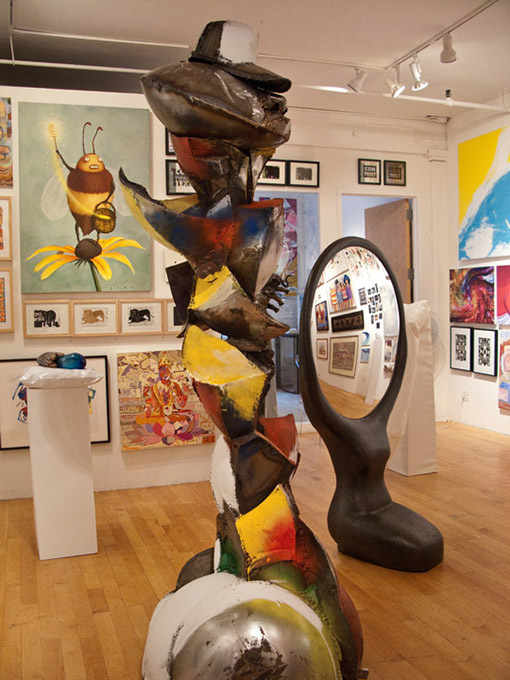 Notice how the sculpture with the mirror reflects the art works on the opposite wall. We moved pieces one or more times. Nothing was fixed in it’s place until the last work was installed. 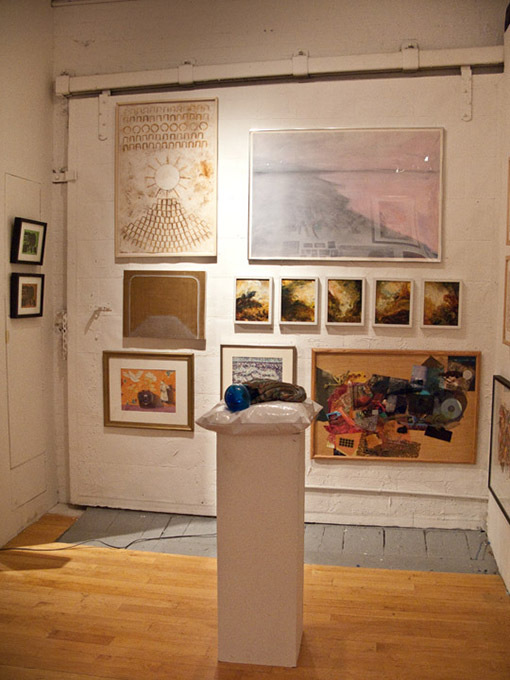 The image below shows a wall with large works. Some are hung very high. 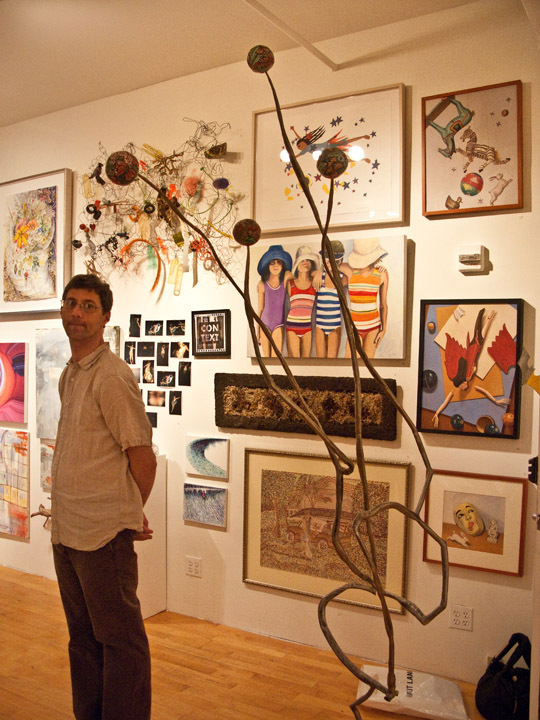 The following image shows Bernard standing in the gallery. I remember he was most of the time balancing on a ladder, reaching up to install a heavy or a large work. 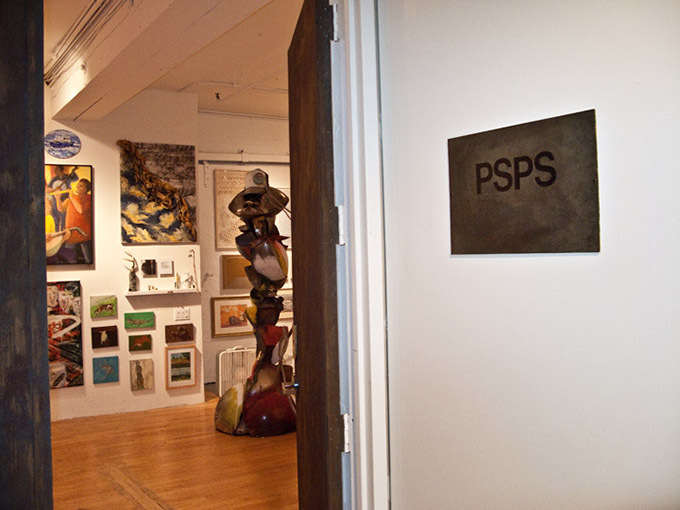 The following image shows the art that the public sees from the hallway. 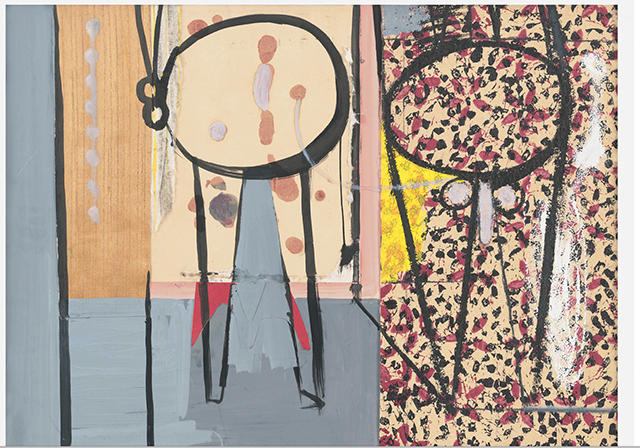 We selected a large work with people because we felt it would draw people in. Notice how diverse the installation is (definitely salon style). The next image shows a close up view of 3 walls as you enter the gallery. Notice all the texture. 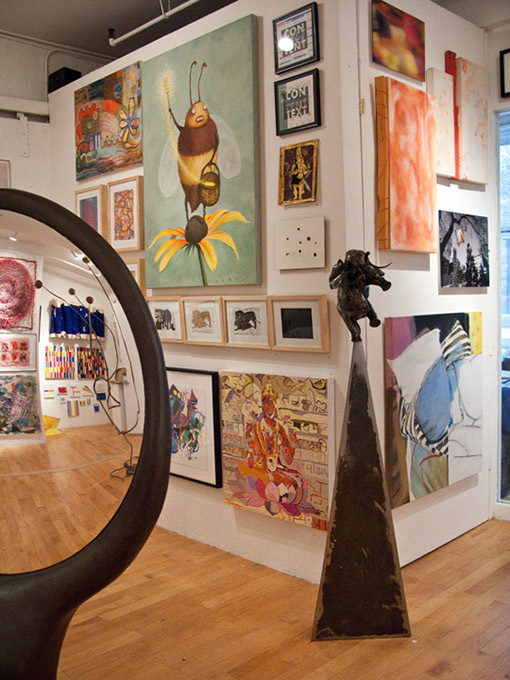 Notice the yellow sculpture installed on the floor. The image above is a front view of the entry wall. The blue dimensional work was moved from another wall. 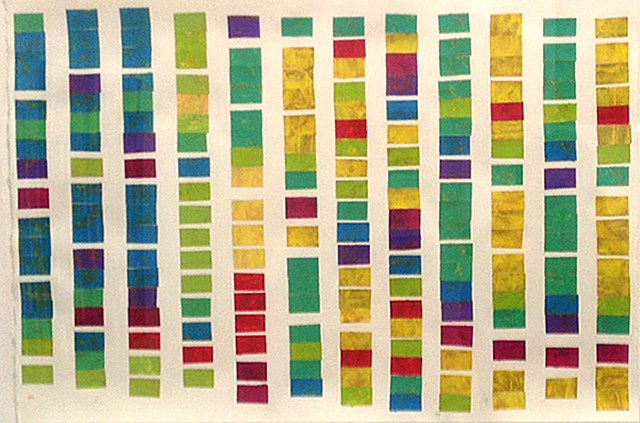 It overhangs my own 2 collage paintings (titled Musical Notes 1 and 2). There’s a lot of work in this tiny alcove space, but it all works well together. As the show was installed, I checked out sight lines. I wanted to see how each work looked in relation to other works that are nearby and across on other walls. When I install art, I want to direct the viewer’s eye (and the viewer should not even be aware of it). 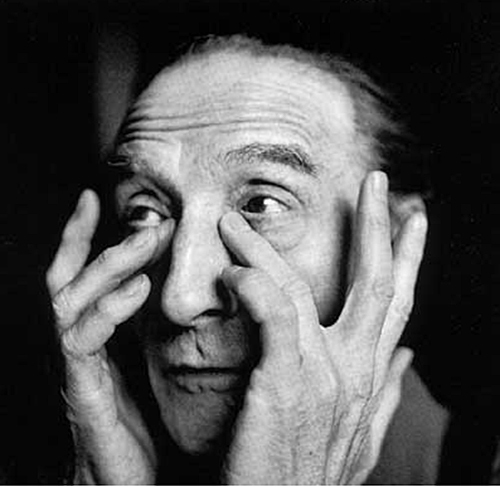 I want to keep the eye in motion – moving around the space like a dance. The images that follow include a view from inside the office into the main gallery space. 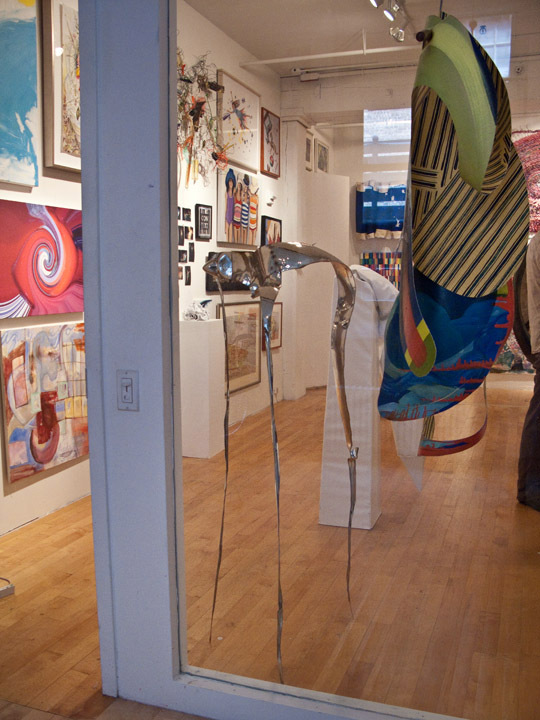 Notice the hanging sculpture in front of the glass wall. The next image shows the installation of works on the last wall – a very delicate wall that we were asked not to put too many nail holes into. 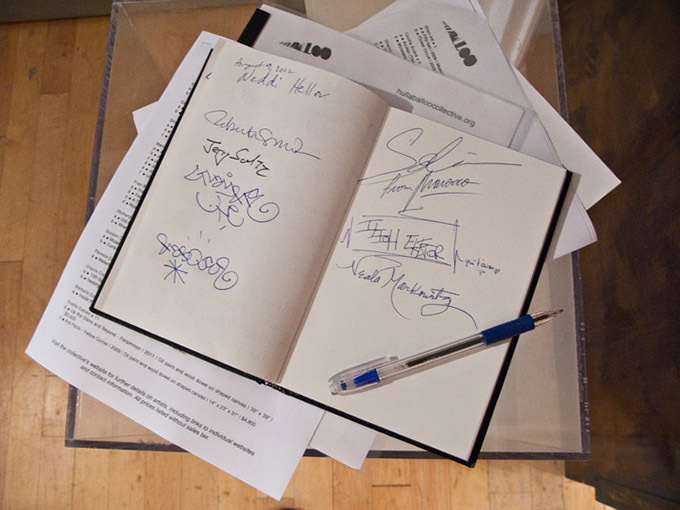 And the final image is the guest book with very creative signatures. See is you can read who’s signed our book. Thank you for your comments about this wonderful show. 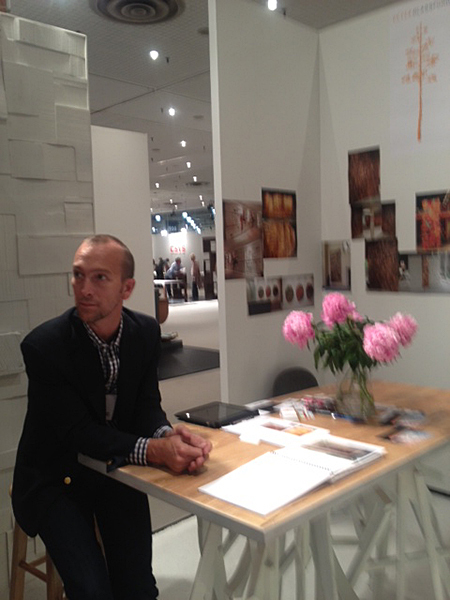 While walking through the 2012 International Contemporary Furniture Fair (ICFF) at the Jacob Javits Convention Center in NYC (May 2012), I discovered work by the artist Peter Glassford. 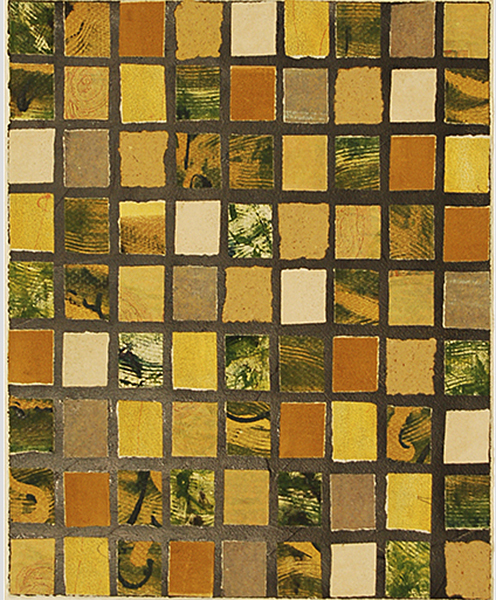 I went to see contemporary rugs and talk with people in the trade about how rugs are made, because people tell me my collage paintings can be interpreted as rugs. Take a look at the geometric images at my website and tell me if you agree they can be room size rugs. 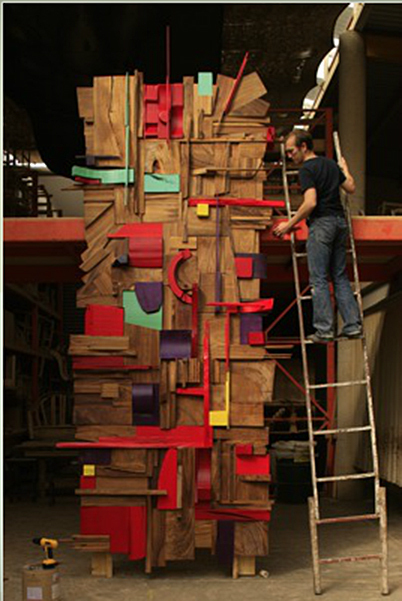 I was amazed to see a dramatic wall installation in wood and paint and learn about works by an artist who calls himself a collage artist in wood. The image above shows the installation and the artist’s mother and the scale of the wall collage. I noticed the color from a distance, then walked closer to see the texture in the natural wood. The paint is a strong crayon green color. The artist is not afraid of color. Peter Glassford has fine arts degrees (BFA, 1986, 1991) from the University of Texas at Austin. The image above shows the artist sitting in front of a wood collage that is a folding screen painted white. Peter Glassford says his wood collage is a fusion of his sculptural past and his business present. He makes unique furniture and he makes art. 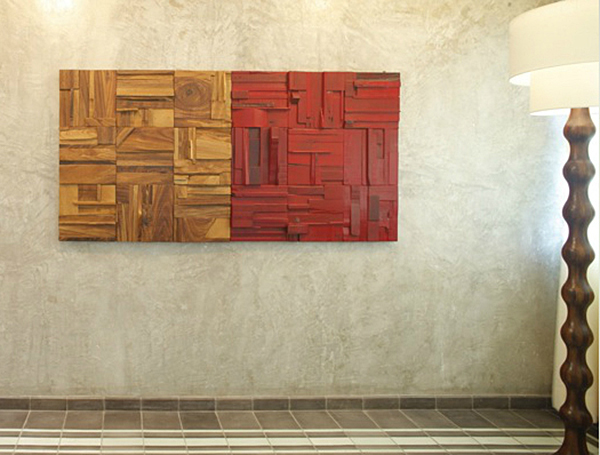 He says he uses wood cuttings from his fine furniture factory in Mexico and creates wall installation art. He says the repurposing closes the creative cycle and brings him back to the studio. 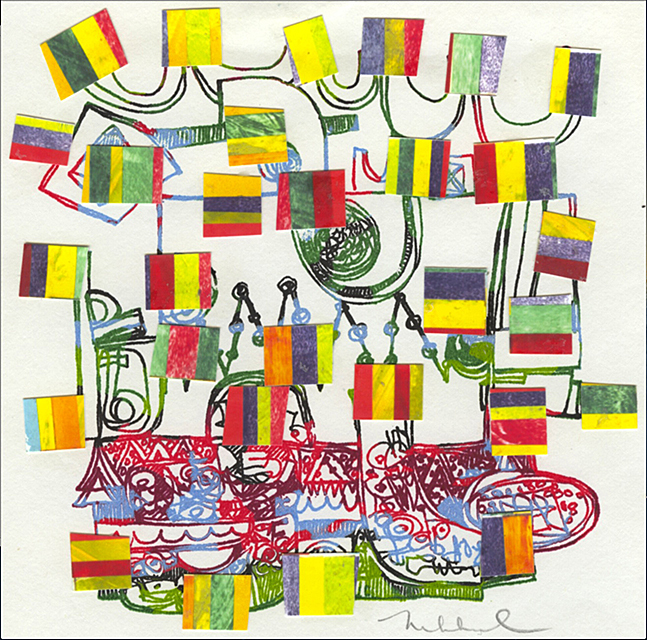 The work above is titled Picadillo Gems (2010). The artists is on the ladder, which shows you how large this work is. It’s installed at the Watts Law Collection, San Antonio, TX. 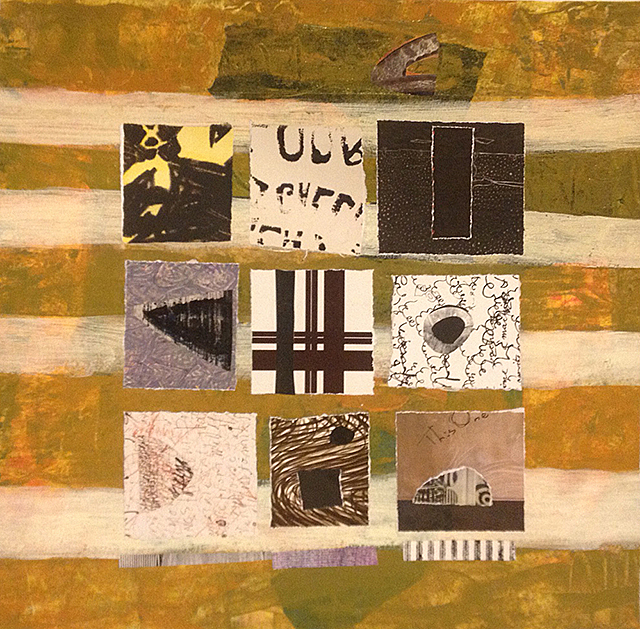 The above image is titled Collage Tiles. Glassford works with exotic woods – one is called parota and the other is rosa morada. I spoke with the artist and mentioned the sculptor Louise Nevelson (1899 – 1988, American, born in Czarist Russia). Because he works in wood, I thought about her work in wood. Wood was the basis for the comparison. But they work in different woods. 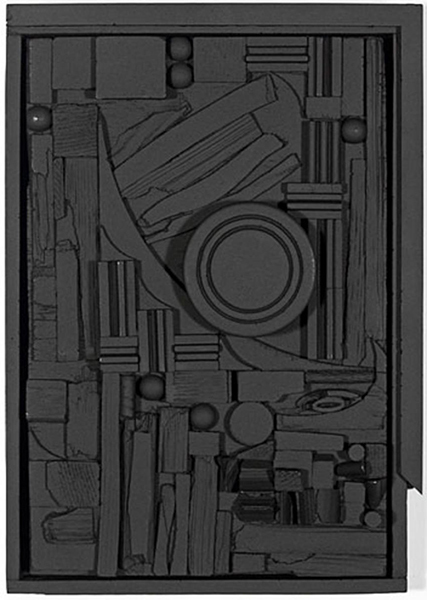 The image above is Nevelson’s wall assemblage in wood, painted black. Some of Nevelson’s works are room size. She described her sculpture as “environments.” She is considered one of the most important figures in 20th-century American sculpture. The image above by Louise Nevelson is titled City Sunscape. Peter Glassford assumed I was comparing what he calls wall collage to Louise Nevelson’s relief sculpture. He didn’t agree with the comparison or the premise. He said Nevelson’s sculptures included found elements that she assembled. He said his sculptures didn’t include found elements like Nevelson’s, but were made with discarded elements – cut-offs left over from the furniture he manufactures in Mexico. 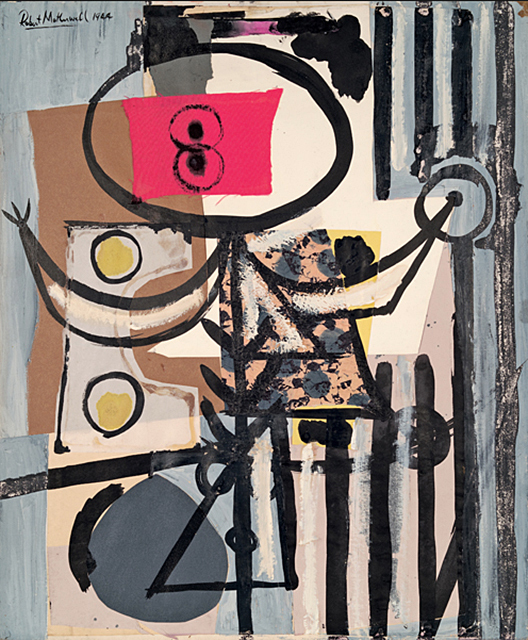 He said Nevelson typically painted her sculptures in an all-over monochromatic white or black. He said he adds painted color (selectively) in the process as the work is installed. Artists are so specific in the ways they describe their studio practice. In my last post, titled Choice Collage, I wrote about the artist John Chamberlain who created metal sculpture and said he was a collage artist in metal. 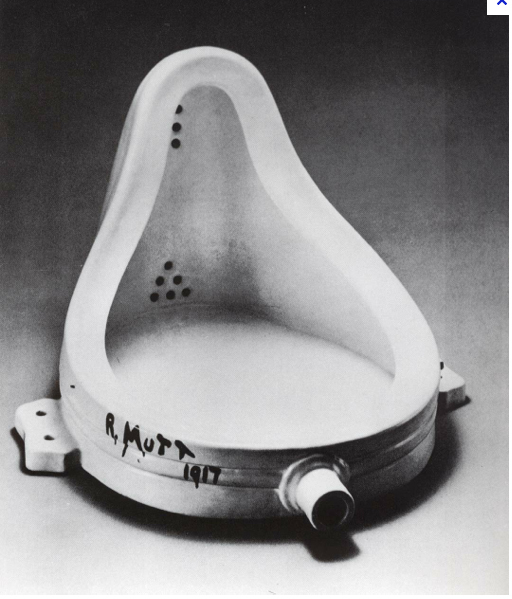 His retrospective exhibition at the Guggenheim Museum in NYC closed May 13, 2012. 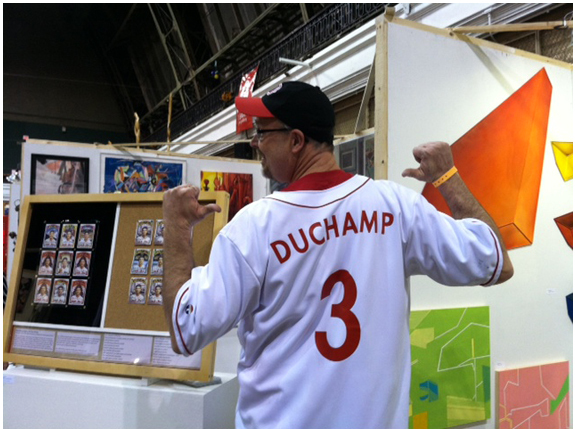 Chamberlain said he chose the pieces for his metal collages. Susan Davidson, who curated the Guggenheim Museum show, emphasized choice in Chamberlain’s work. What is the difference between selecting and choosing and finding? I think everything is about choice. 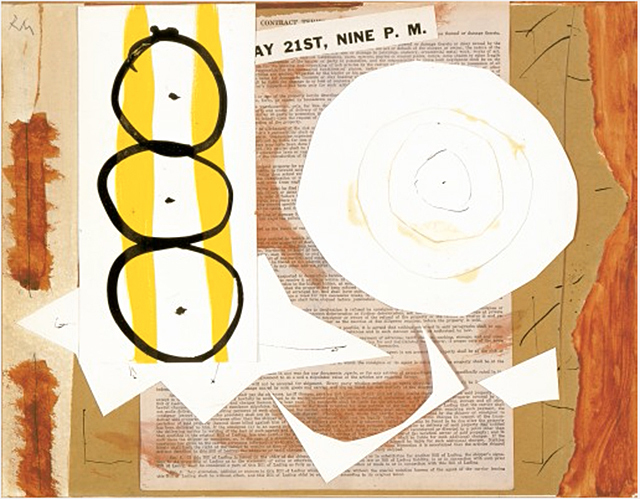 I wonder if Louise Nevelson ever called herself a collage artist. 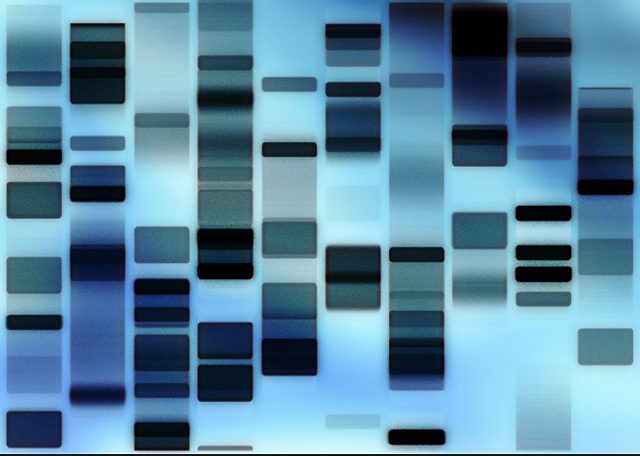 All image of work by Peter Glassford are from his website (Projects). 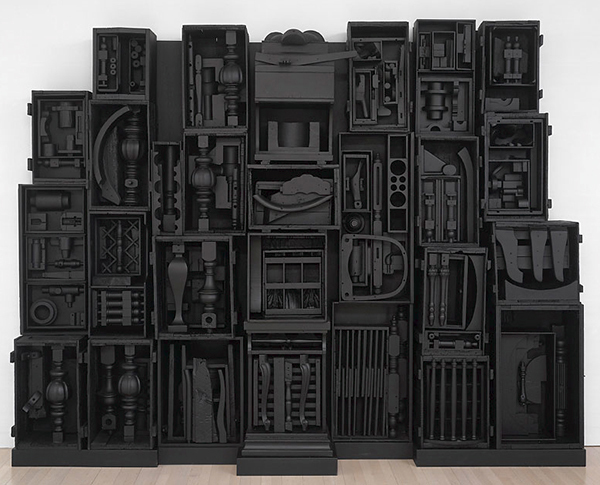 All images of work by Louise Nevelson are courtesy the Internet.